Mayline Corsica series has office furniture products that are made with comfort of the workers in mind. These product series have a wide choice of comfortable office furniture. These products are worth your consideration because you will spend most of the time working in the office hence you need accommodating furniture. Corsica collection has the perfect furniture for your modern office. It has different types of office desks therefore you just need to find what is appropriate for the kind of work you do at the office. Offices are constructed in varying designs therefore the size and shape will differ. These are considerations you should have in mind when choosing your office furniture so that your space does not get overcrowded. You should buy furniture that will occupy enough room but still leave space for moving around and other activities. It has a wide variety of components so you can get the perfect size for your office space. Office furniture cannot be replaced everyday hence there is a need to get what will last long enough and still by stylish. Corsica from Mayline has durable well built desks. The hand crafted desks are made using North American special AA grade wood veneers. The finishing process takes 14 steps. The result is a quality and splendid desk. The 2 inch thick surfaces with taper edge makes the desks long lasting. 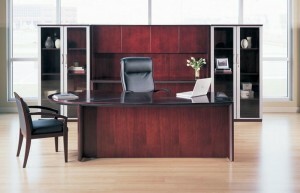 Other office items in the series include credenzas, hutches, cabinets, pedestals and wall cabinets. All these products are designed by experts who have elegance and aesthetic appeal in mind. The wall units are perfect for storing items like books, files and stationery rather than filling up your desk space. There are different types of wall cabinets so you just need to go through them and get the ones that suit your preference and space. These cabinets have either adjustable or fixed shelves. This series is superb for your modern office furniture needs. e5 series is Mayline furniture’s evolution to collaborative furniture for office setting. It is the perfect solution for offices requiring certain collaboration hindered by the panel. It’s a practical solution utilizing any material that can save space at a work place. It has expansive power capacity for an office setting requiring interaction without isolating walls. Offers logical and insightful structure developed using least number of materials. It is simple to specify this structure. You can use it to furnish everything including an open space, benching applications and private offices. When you use it, you will promote partnership and productivity. When you use the e5 collection, you are prepared for the future developments as it is easy to reorganize, devise and reuse space according to arising conditions. You can easily convert the executive desk to a bench or the other way round. 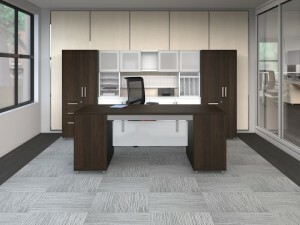 E5 is essential to create your private office giving it a unified look and feel. It incorporates wall mounted and free standing components that enable you to create some endless configurations using traditional to modern finishing and colors. Benching is created for comfort and productivity with the option for standing height working surface and an overhead storage. The storage units have free standing case goods including wardrobes, desk height base units and bookcases that have metal legs to allow cleaning. Technology beltway is for carrying data and power lines to their users at seated height. You can also make numerous office installations with simple affordable material just by using e5 series Mayline office furniture. Medina Series is an excellent choice if you want to give your office a modern functionality and an elegant style. The combination will make your office to have exceptional value that will appeal to workers and visitors. Medina Simplify the work of searching for furniture that meets your style as it has the entire essential products. The wide range of products enables you to furnish your office as per your desired theme. It’s components are made in different dimensions therefore you can choose the desks, hutches, corner supports and credenzas. It also has lateral fields, bookcases, pedestals and right and left hand bridges. It has appealing aesthetic designs for its furniture. There is even a floating workspace reflecting in the Italian design. The Medina collection desks are designed to give total comfort. They are designed to meet your likes and budget. The desks have appealing décor therefore add to charming office atmosphere. Hutches which are a good option for storage of your office paperwork. You have a choice of compact or bigger hutches so you just find what will fit to the general size of the office desks. The hutches are made of durable material for longevity. The Series also has a line of pedestals and drawers which are known for their storage capacity. They are highly useful in storing stationery, office equipment and filing papers. The drawers and pedestals are in wide range of finishes and sizes making it simpler to identify what matches your office environment. It also include mobile pedestals that you can use for portable storage. These pedestals give you advantage of mobility around the office. The units are secure because they are fitted with strong locks. 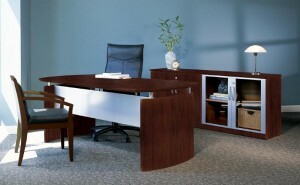 They also have attractive coats so you can choose what will complement other furniture in your office. Wall cabinets, bookcases and lateral files are other suitable alternatives for desk and storage needs within Medina series. 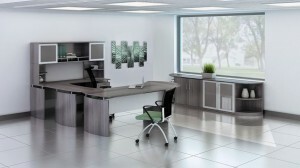 Finding the right office is just one step and you will only settle after getting the proper furniture for your office. You need well built desks and very comfortable chairs that can accommodate workers for long hours. Mayline the leading North American furniture maker has proper office desks and storage furnishings in the Napoli Series. This series has durable line of components that will serve their purpose for many years to come. This is because all the furniture is hand crafted using North American select wood- AA-grade- veneers. The furniture has to go through a long finishing process of 14 steps to guarantee that they have uncompromisable quality and consistent beauty. Credenzas, pedestals, extensions, right hand and left hand bridges are available in this collection. Napoli Collection combines stylish accents and modern lines. Desks in the series are a good impression of art. They have surfaces that merge smoothly defining office space with efficiency and elegance. The surfaces have borrowed a “floating” Italian influence. It has different sized high and low wall cabinets for storage options. The cabinets have enough space to store most of the things in an ordinary office. There are some designed to accommodate electronic devices together with their wires and cables. If your office has many files and other paperwork, you can get convenient cabinets that have drawers. Napoli from Mayline still has another storage option for papers and books in the form of bookcases. The bookcases are in various shapes, sizes and finish. You can easily find bookcases that will add a personal touch to your office background or match the rest of the furniture. The bookcases can be fixed or adjustable. With Napoli Series components, you have solutions to office requirements. Click over to the individual series page to see more images and links to their price books. We have a Half Price Sale On Now so Call 727-330-3980 with any questions you may have or let us create a layout from your floor plan and provide a quote complete with your 50% Off Sale Pricing.